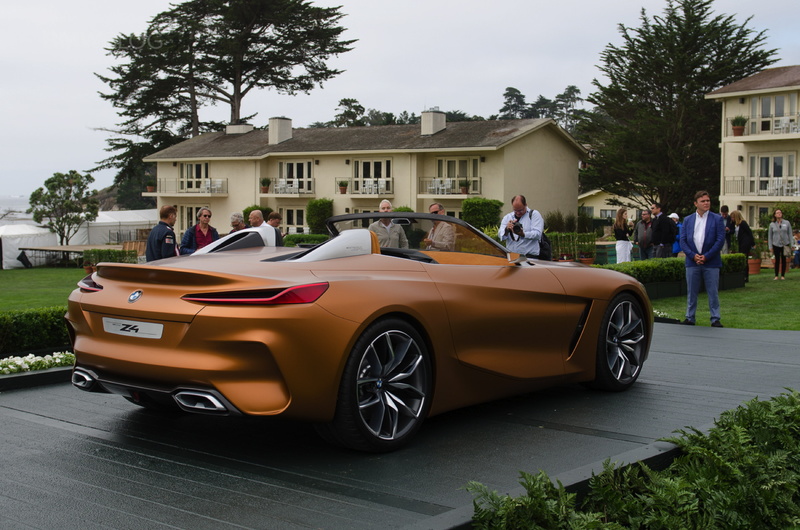 We bring you the first live photos of the BMW Concept Z4 unveiled today at Pebble Beach. 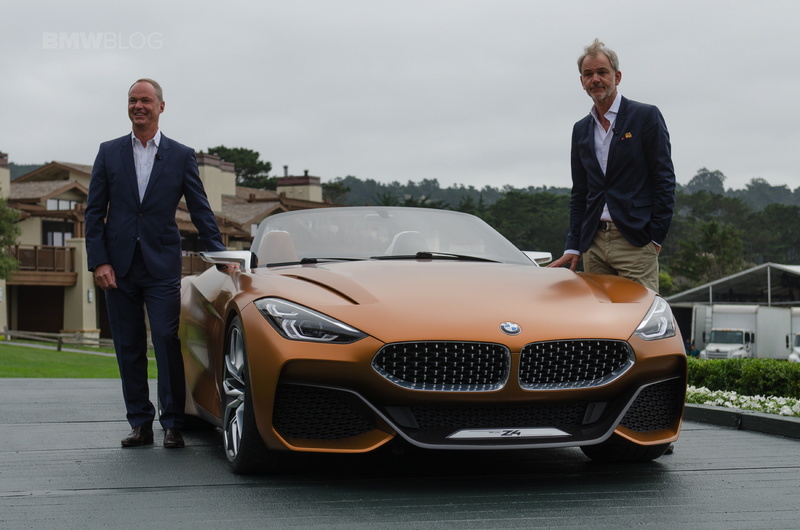 BMW Group head of design, Adrian Van Hooydonk presented the car which previews the production roadster out in 2018. The production Z4 is a joint project between BMW and Toyota. The platform will also underpin a Toyota sports car that’s expected to be the long-awaited successor to the Supra. 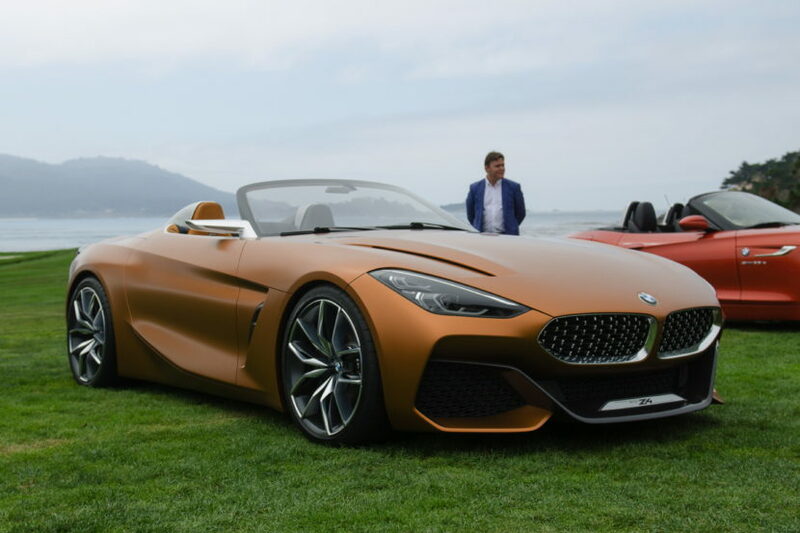 “The BMW Concept Z4 expresses the new BMW design language from all perspectives and in all details. From the dynamic looking front to the striking flanks to the clean-cut tail end: a few lines and the subtle interplay between surfaces are enough to generate a sense of power and emotion,” says Adrian van Hooydonk, Senior Vice President BMW Group Design. The Concept Z4 features squinting headlights that sweep upward toward wedge-shaped lines on the side. 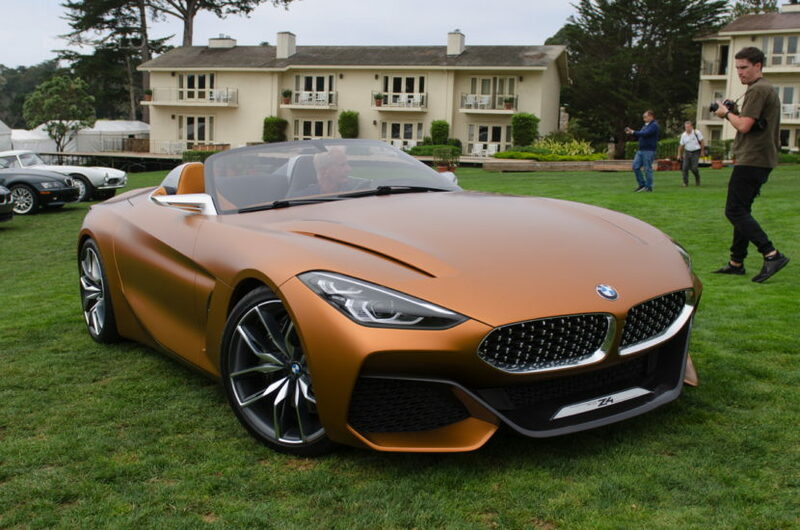 BMW’s signature kidney grills and the shark nose front end have both been updated for Concept Z4. The side view reveals the front and rear overhangs are short, and the cabin moves slightly forward. The air intakes are low and wide, giving a focused look. Carbon-fiber elements grace the front and the rear diffuser while the car is painted in a BMW Frozen color, Energetic Orange, a theme that is repeated inside the car. The 20-inch wheels on Michelin Pilot Sport Cup 2 rubber are perfect for the sporty character of the car. Inside, the classic sports car with a modern twist theme carries on. The three-spoke steering wheel is simple and elegant, yet futuristic and modern. Aside from those massive red paddle shifters add some flamboyance but this is a simple cockpit, overall. Instrumentation is displayed via a TFT screen, with a clockwise speedometer on the left and a counterclockwise tachometer on the right. 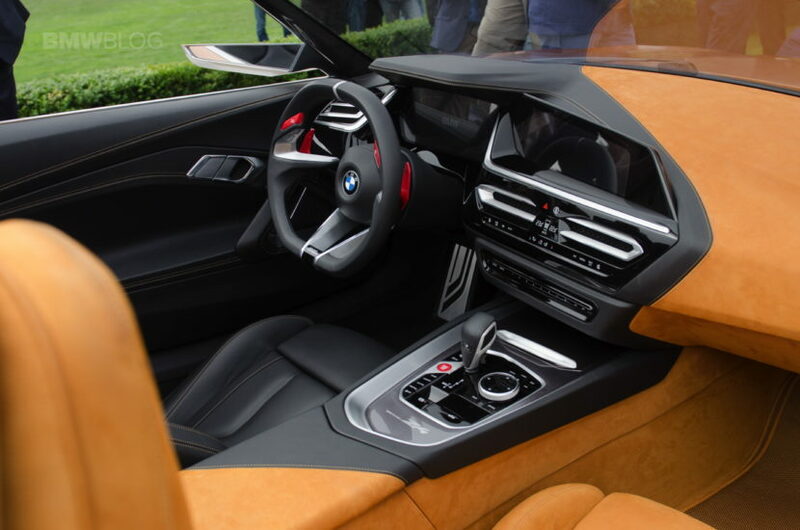 While this is a very concept-y cabin, it does have a lot of modern BMW elements that could make it to production. BMW didn’t really delve into powertrains for the concept. It’s believed that when the Z4 comes to production, it will carry both four- and six-cylinder engines, like most of the rest of BMW’s lineup. The Z4’s underpinnings, which were developed in a joint venture with Toyota, will also live on as the next-generation Toyota Supra.